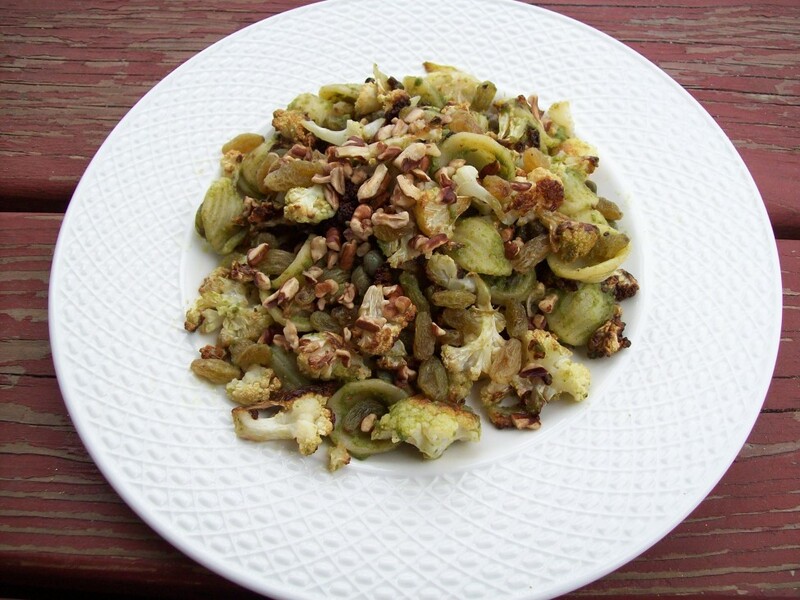 This is an unusual, hearty, rustic vegetarian dish that plays on well-known flavor combinations. Cauliflower with capers and raisins, pecans with raisins and carrot…it all works together to bring elements of savory, salty, briny, sweet, and earthy to the plate. If you make the pesto in advance and store in the refrigerator or freezer, this can also be a relatively quick and easy dish to pull together on a busy night. Fill a medium saucepan with water and bring to a rolling boil. Add the carrot greens to the water and cook for 3 minutes. Drain thoroughly and rinse the blanched greens with cold water to stop the cooking process. In a blender or food processor, combine the carrot greens, parsley, nuts, garlic, olive oil, salt, and pepper. Pulse until you have a smooth paste (you can add 2 tablespoons of water if you need a bit more liquid to help it along). Transfer the pesto to a large bowl. Stir in the cheese and lemon juice. Preheat oven to 400 degrees. On a large baking sheet, toss the cauliflower florets with the olive oil, salt and pepper. Roast the cauliflower at 400 degrees for 15-20 minutes, stirring once, until browned and crispy. Cook the pasta according to package directions. About halfway through cooking, remove 1/4 cup of the pasta water and pour over the golden raisins in a small dish. Drain the cooked pasta thoroughly, reserving about 1 cup of the cooking water. Transfer pasta to a large bowl. Add the roasted cauliflower. Drain the raisins and add them to the pasta mixture. Add the capers and pesto, then toss everything until it’s well-coated, adding a bit of the reserved pasta water if necessary to thin the sauce. Top each serving with the additional pecans.